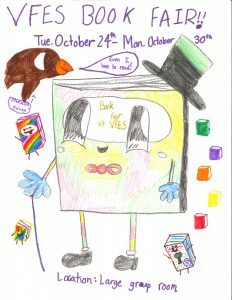 Congratulations Maura M. for winning the 2017 Book Fair Flyer Contest! The Book Fair is an annual PTO fundraiser held in the Large Group Room at the end of October. We work with an independent bookseller to provide an array of books to appeal to all readers. All purchases are completely voluntary. Last year the PTO raised over $2,000 to benefit VFES! Each class will have a chance to visit the Book Fair. Your child will create his/her own wish list. The list is sent home, and you can either identify the books they wish to purchase and return the wish list with payment, or you can visit the Book Fair in person during the times listed above. We accept cash, checks, and credit cards. There is also an opportunity to purchase books for the teachers and their classrooms. Click on the “+” to expand and see the schedule. We need your help to make it a success! You can help the children preview the books during their class visit, or help with the set up or tear down. Feel free to bring your younger children with you when you volunteer. No need for a babysitter! Questions? Contact Caren Trudel at caren327@yahoo.com. Would you like your artwork to be used to publicize the VFES Book Fair? We are looking for a design that will entice students and parents to the fair! Click on the “+” to expand and see the Instructions and Rules. Create your own design on an 8.5″ by 11″ sheet of white paper. Use only crayons or markers, not pencils or highlighters. Submit your design, along with: your student’s name and grade; homeroom teacher’s name; and your email address and telephone number. Turn in your design through your Red Folder or place it in the specially marked box in the VFE office. Contest deadline is Wednesday, October 17, 2018. Students in all grades are eligible. The winning cover design will be selected by the VFE School Climate Committee, which includes one teacher from each grade team, and Mrs. Wills, School Principal. The entries will be de-identified prior to selection. The winner’s design will be used to advertise the Book Fair, and receive a $10 voucher to use at the fair!